Getting enough vitamin D and calcium are two of the best things you can do to keep your bones healthy. Calcium is needed for our heart, muscles, and nerves to function properly and for blood to clot. Low calcium intake throughout life is associated with low bone mass and high fracture rates. As per National nutrition surveys, most people are not getting the calcium they need to grow and maintain healthy bones. The body needs vitamin D to absorb calcium. Without enough vitamin D, one can't form enough of the hormone calcitriol (known as the "active vitamin D"). This in turn leads to insufficient calcium absorption from the diet. In this situation, the body must take calcium from its stores in the skeleton, which weakens existing bone and prevents the formation of strong, new bone. These two nutrients work together to make you less likely to bone loss (osteoporosis), weak bones (osteomalacia/rickets), decreased activity of the parathyroid gland (hypoparathyroidism), and a certain muscle disease (latent tetany). If we have adequate amounts of calcium and vitamin D, it really can help with keeping bones strong. This combination also plays an important role in pregnant, nursing or postmenopausal women. Additionally, magnesium helps keep calcium in the cell to do its job far better. Zinc is known to play an important role in the bone remodeling cycle and is also essential for many bodily functions including the immune response, reproduction, growth and development, and neurological roles. This medication is used to prevent or treat low blood calcium levels in people who do not get enough calcium from their diets. It may be used to treat conditions caused by low calcium levels such as bone loss (osteoporosis), weak bones (osteomalacia/rickets), decreased activity of the parathyroid gland (hypoparathyroidism), and a certain muscle disease (latent tetany). It may also be used in certain patients to make sure they are getting enough calcium (e.g., women who are pregnant, nursing, or postmenopausal, people taking certain medications such as phenytoin, phenobarbital, or prednisone). Calcium plays a very important role in the body. It is necessary for normal functioning of nerves, cells, muscles, and bones. If there is not enough calcium in the blood, then the body will take calcium from bones, thereby weakening bones. Having the right amount of calcium is important for building and keeping strong bones. Magnesium assures the strength and firmness of bones and makes teeth harder. It is essential for absorption and metabolism of calcium. Magnesium also has a role to play, together with the thyroid and parathyroid glands, in supporting bone health: stimulating the thyroid's production of vitamin D3, which acts as a bone-preserving hormone, and regulating parathyroid hormone, a function of which is to regulate bone breakdown in a number of ways. The enzyme that is required for forming new calcium crystals, alkaline phosphatase, also requires magnesium for activation, and if levels are low, abnormal bone crystal formation can result. Even mild magnesium deficiency is reported to be a leading risk factor for osteoporosis. 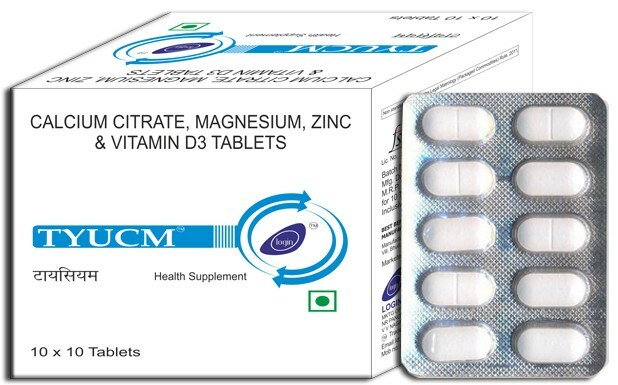 Zinc is a trace element that is chemically similar to magnesium. It is essential for many bodily functions including the immune response, reproduction, growth and development, and neurological roles. Zinc acts as a cofactor for enzymes that are involved in protein and nucleic acid synthesis, and is known to play an important role in the bone remodeling cycle. Where it is involved as a cofactor for proteins involved in deposition and resorption of the bone matrix; plays a regulatory role; and is involved in the structure of the bone itself. 1. Bone mineral hydroxyapatite crystals contain a complex of zinc and fluoride. 2. Zinc stimulates bone building osteoblasts, and inhibits the function of bone resorption by osteoclasts. Vitamin D3 is used to treat and prevent low levels of calcium in the blood of patients whose kidneys or parathyroid glands (glands in the neck that release natural substances to control the amount of calcium in the blood) are not working normally. Low blood levels of calcium may cause bone disease. It works by helping the body to use more of the calcium found in foods or supplements. Vitamin D3 is also sometimes used to treat rickets (softening and weakening of bones in children caused by lack of vitamin D), osteomalacia (softening and weakening of bones in adults caused by lack of vitamin D), and familial hypophosphatemia (rickets or osteomalacia caused by decreased ability to break down vitamin D in the body).It is also sometimes used to increase the amount of calcium in the blood of premature (born early) babies. Calcium Citrate: Approx 33% of oral calcium absorbed via active transport and passive diffusive in small intestine. Vitamin D3: Well-absorbed from GI tract in the presence of bile. Calcium Citrate: Skeletal tissue, breast milk. Crosses placenta. Vitamin D3:Vitamin D3 and metabolites binds to vitamin D -binding protein and are circulated in the blood. May be stored in adipose and muscle tissue for prolonged periods. Calcium Citrate: Calcium Citrate is a readily digested and absorbed form of Calcium. Vitamin D3: Hydroxylated in liver to form 25-hydroxycholecalciferol, then hydroxylated in kidney to form active metabolite 1,25-dihydroxycholecalciferol. Calcium Citrate: Unabsorbed calcium mainly excreted via faeces. Excess absorbed calcium excreted via urine. Vitamin D3:Vitamin D3 and metabolites are mainly excreted in the bile and faeces. ●	Impaired calcium absorption in achlorhydria which is common in elderly. 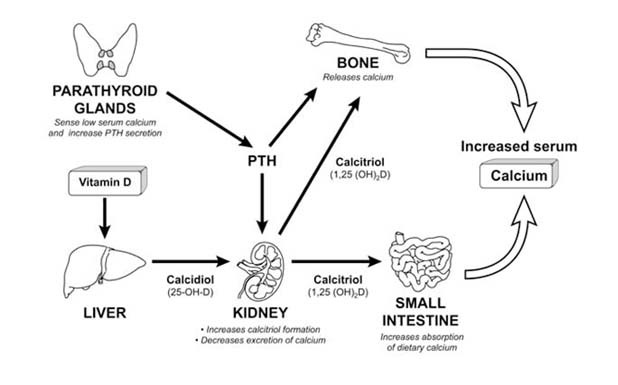 ●	Increased risk of hypercalcaemia and hypercalciuria in hypoparathyroid patients on high doses of vitamin D.
●	History of kidney stones. Store in cool and dry place.